raise our profile by expanding the base of those who know us through our letterpress and bookmaking workshops. WINTERTHUR MUSEUM INVITED LEAD GRAFFITI TO PARTICIPATE in their annual "Terrific Tuesdays: Art Rules!" which meets every Tuesday in July and August, from 10 am – 3 pm. Hands-on crafts and games inspired by various aspects of the museum, garden and library teach kids (aged 3 - 10) about color, line, form, and other elements of art. Special guests highlight skills and trades from the past and present, with new activities and guests presented each week. Members and children under 2 free. Nonmembers: $5 per child and one adult; additional adults $15. Please note that Terrific Tuesdays is reserved for Winterthur members or paying guests. We plan to offer our colorful H.N. Werkman workshop for Winterthur's visitors, so if you're in the area, come check us out. We agreed to do July 3, which is likely to be a smaller group as it is the first of the Tuesdays and also the day before the 4th of July holiday. A more modest crowd will give us the opportunity to test a stripped-down traveling version of this particular workshop in their workspace with all ages of participants. If things work out on July 3 (shape), we will also be doing August 28 (color), so mark it on your calendar. 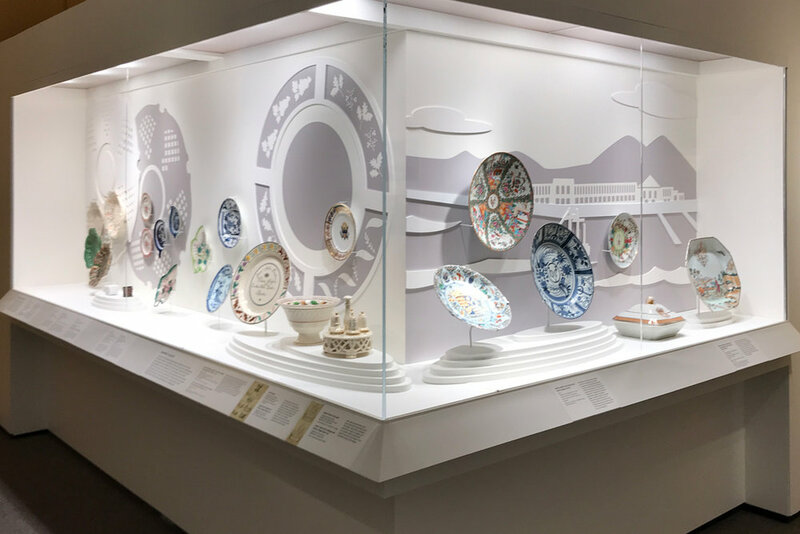 AFTER OUR ORGANIZATIONAL MEETING, we were graciously invited to visit Winterthur's current exhibition entitled "Dining by Design: Nature Displayed on the Dinner Table." It is interesting to start into something with a bit of indifference and find yourself completely dazzled. The hundreds of items on display take you back to a day when craftsmanship was the norm. Each item was covered in amazingly detailed images, hand painted in various glazes to arrive at the correct colors, or carved with realistic detail and intricate precision. Filling several large rooms, these plates, tureens, gravy bowls, serving utensils and more were painstakingly created by human hands with the technology and colors available at the time. The most complimentary, yet unobtrusive, environment has also been created around these uncommonly designed, yet everyday objects. Jill and I are both designers, and one of the things that we really appreciated was the presentation of the exhibition, which was produced with a beautiful visual mastery. The display items were covered with images, minute details, and texture. The backdrops for those items were handled in a layered, but flat style, executed in soft grey and white and shadow. The contrast between foreground and background was stunning. See the photo at the top. Connecting to our letterpress and typographic lives were several plates, which while being illustrated with dining-related items, and also functioned effectively as "type specimens." Jill and I also got caught up in the subtle and hopefully unnoticeable details of exhibition design. Try to imagine how hard it is to display heavy and delicate objects vertically on a wall, like rare and expensive ceramic plates, and provide support in an unobtrusive way. In the photo above notice the two nails which hold the plate at both sides of the bottom. The nails have a flattened protrusion which holds the plate in position while being painted to blend with the design. Below is a closeup to make the point. The day before we saw this exhibit we had quoted a line from the movie "Finding Forrester" starring Sean Connery to a.friend. "The key ... is an unexpected gift at an unexpected time." The exhibition is on display until January 6, 2019.